National estate agents Leaders has renewed its commitment to growth in 2017 with the acquisition of a local firm in Nottingham. Leaders last week completed the purchase of Bulmer Estates, a family-run business owned by Andrew and Rebecca Bulmer and based in the West Bridgford area of the city. It is the latest stage in Leaders’ ambitious expansion strategy, which saw it and sister company Romans acquire more than 100 businesses in the ten years to the end of 2016 and create a combined branch network of more than 150. Rebecca Bulmer, former owner of Bulmer Estates, says: “Leaders’ acquisitions team has been a pleasure to work with and has proved really supportive and helpful at all times. The whole process has been a revelation in how a good sale should progress compared with our previous abortive experiences. 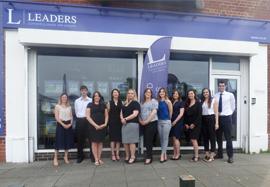 Leaders initially moved into Nottingham in 2015 with the acquisition of PWR Lettings & Sales.